This week’s theme includes tons of Christmas decorations and novelty clothing, toys, some electronics, and a few items for the kitchen. 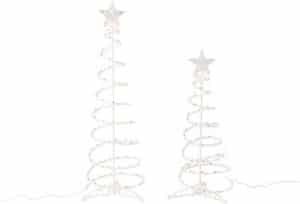 Huntington Home Light-Up Spiral Tree Set, $19.99. Choose White or Multicolored lights. These come in a two-pack of 3′ and 4′ sizes. For indoor/outdoor use. Huntington Home 2′ Pre-Lit Tabletop Tree, $7.99. Christmas Can with Greens, $9.99. Assorted colors available. Merry Moments 7′ Christmas Inflatable, $29.99. Choose Santa, Snowman, or Nutcracker. Merry Moments 10-Pack Pop-Up Christmas Cards, $6.99 per pack. Cards measure 4″ x 6″. Heavyweight Jumbo Gift Wrap Roll, $3.99. Rolls measure 30″ x 180′. Merry Moments Ugly Sweater Wine Bottle Cover, $2.99. Assorted varieties available. Merry Moments 20″ x 30″ Holiday Accent Rug, $6.99. Merry Moments Decorative Holiday Pillow, $6.99. Made of 100% polyester in assorted styles. Merry Moments Holiday Throw, $4.99. Made of 100% polyester in assorted styles. Huntington Home Holiday Figurine Assortment, $12.99. Assorted varieties. Two AA batteries included. Measures 11.5″ H.
Merry Moments Holiday Flameless Candle Lantern, $9.99. Measures 12″ H. Assorted varieties. Candle not included. Merry Moments 3-Pack Holiday LED Flameless Candle Set, $9.99. Includes 4″, 6″, and 8″ candle. Choose Red Ice or Gold Glitter. Batteries not included. Merry Moments Battery-Operated LED Lights, $2.99. Batteries not included. Timer included. Huntington Home Holiday LED Canvas Art, $9.99. Two AA batteries not included. Huntington Home Set of 3 Glass Hurricanes, $19.99. Assorted designs. Merry Moments Holiday Tinsel Figurines, $4.99. Measure 5.5″–12″. Assorted styles. Merry Moments Men’s or Ladies’ 2-Pair Holiday Socks, $1.99. Fits Men’s Sizes 6–12; Ladies’ Sizes 4–10. Merry Moments Adult Union Pajama, $14.99. Sizes M–XL. Choose Moose, Elf, or Santa. Available in matching Kids’ sizes. Merry Moments Men’s or Ladies’ Holiday Pajama Sets, $9.99. Sizes M–XL. Two-piece sets. Choose Moose, Elf, or Santa. Merry Moments Novelty Christmas Slippers, $7.99. 24.99X-SHOT by ZURU Turbo Advance or Regenerator, $24.99. Shoots up to 80′. Soft foam darts included. Bee Happy Truck Transporter with Cars, $18.99. Includes 15 die-cast cars. Carries up to 44 cars. Bee Happy Wooden Pizza, Cake or Sushi, $8.99. Realistic food and serving pieces. FSC-certified wood. Bee Happy Plastic Animal Set, $5.99. Includes 25 pieces. Crane 2-in-1 Game Table, $49.99. Quickly change from air hockey to foosball. Measures 42″ L x 20.25″ W x 30″ H.
Infantino Teepee Grow-with-Me Playtime Gym, $49.99. Four play positions. Measures 34″ W x 34″ D x 44″ H.
Bendon Storybook Activity Pad, $5.99. Hasbro Baby Alive Doll, $18.99. Assorted varieties. Fisher-Price Animal Piano, $19.99. Assorted varieties. Kids’ Licensed Walkie Talkies, $14.99. Includes Trolls and Incredibles. Mattel Chomp ‘N Roar Mask, $29.99. Mask is Velociraptor Blue from “Jurassic World”. Three sound levels. Clever Factory Giant Animal Book, $5.99. Assorted varieties. Animals: 10.6″ x 12.74″; Dinosaurs: 9″ x 14.5″. Bauhn Wireless Charging Pad or Stand, $24.99. 10W fast charge. Works with all Qi-enabled devices. Bauhn Charge Tower Pro, $12.99. Charge up to 6 devices simultaneously. iHome Bluetooth Rechargeable Waterproof Speaker, $24.99. IP67 certified. Ambiano 4.6-Quart Stand Mixer, $29.99. Five speeds plus turbo boost. Huntington Home 20″ x 32″ Memory Foam Kitchen Mat, $9.99. Assorted colors. Crofton Flour Sifter or Batter Dispenser, $4.99. Crofton Mini Utensil Assortment, $1.29. Crofton Silicone Baking Mats, $4.99. Fits 11″ x 17″ or 9″ x 13″ baking pans. Crofton 2-Pack Holiday Tins, $2.99. Huntington Home Memory Foam Chair Pad, $5.99. Fits most chairs. Features slip-resistant back. SimplyNature Family Pack Organic Grass-Fed 85/15 Ground Beef, $4.49 per lb. Sold in a 4-lb. pkg. for $17.96. St. Louis Pork Spareribs, $1.99 per lb. Ambiano, Bauhn, Bee Happy, Bendon, Clever Factory, Crane, Crofton, Fisher-Price, Hasbro, Huntington Home, iHome, Infantino, Mattel, Merry Moments, Simply Nature. Bookmark. Rachel, got several boxes of the window candles to use. They work great and the timer is very helpful. Didn’t notice that bases can be silver or gold u til I got home. Used silver in one room and gold in the other. I really like them! Dry Soda flavors, lavender, cucumber, apple, watermelon appeared once…we loved them…can we get more?